WEDNESDAY, July 20, 2016 (HealthDay News) -- Doctors aren't using one of the most effective weapons at their disposal in battling addiction to prescription painkillers -- the anti-addiction drug Suboxone, a new study finds. 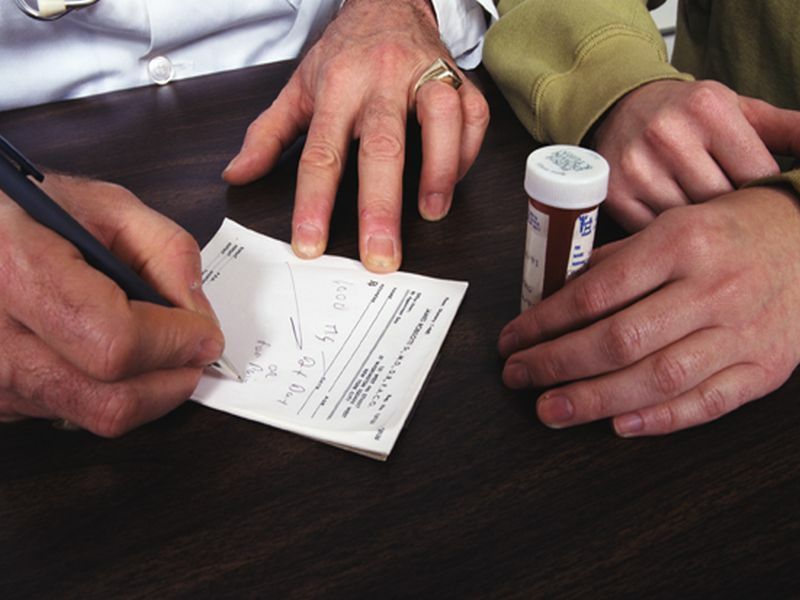 A review of Medicare claims showed that U.S. physicians are woefully underprescribing Suboxone. The drug is the only therapy Medicare covers to treat opioid addiction. "For every 40 family practice physicians who prescribed an opioid painkiller, only one prescribed Suboxone," said lead author Dr. Anna Lembke. She's chief of the Stanford Addiction Medicine Dual Diagnosis Clinic at Stanford University in Palo Alto, Calif.
"There's lots and lots of prescribing opioids for pain, but very little prescribing of this specific drug to treat opioid addiction," she added. There's an epidemic of prescription painkiller abuse in the United States. In 2014, prescription drugs contributed to nearly 29,000 overdose deaths from painkillers or heroin, more than any year on record, the U.S. Centers for Disease Control and Prevention said. Medicare patients have one of the fastest growing and highest rates of opioid abuse in the United States. More than six out of every 1,000 Medicare patients have been diagnosed with an opioid addiction. Hospitalizations due to overuse have been increasing by 10 percent a year, the researchers noted. However, Medicare doesn't cover methadone, the longest-standing treatment for opioid addiction, Lembke said. Instead, Medicare covers Suboxone, a pill that combines two addiction-fighting drugs -- buprenorphine (Buprenex, Bunavail) and naloxone (Evzio). Buprenorphine is a weak opioid that has effects similar to acetaminophen/oxycodone (Percocet) or oxycodone (OxyContin). But, the effects level off at moderate doses. This reduces the risk of misuse and addiction, according to the U.S. Substance Abuse and Mental Health Services Administration (SAMHSA). The other component is naloxone. Naloxone blunts the effects of opioids and can reverse an opioid overdose, SAMHSA explains. Naloxone is prescribed on its own as a lifesaving measure for people who have overdosed on opioids. A study released online in June in the Annals of Internal Medicine found that prescribing naloxone to chronic pain patients who take painkillers can reduce overdose emergencies. For the new study, Lembke and her colleagues examined 2013 Medicare Part D claims data to see whether doctors were making effective use of Suboxone. The investigators found almost 7,000 prescribers who had filed 486,000 claims for Suboxone. The prescriptions were written for about 81,000 patients. Those prescribers represented less than 2 percent of the 382,000 prescribers who had filed more than 56.5 million claims for prescription painkillers, the researchers found. Specialists in addiction medicine handed out the most prescriptions for Suboxone, nearly 99 claims per prescriber in 2013, the study revealed. On the other hand, pain management physicians rarely prescribed Suboxone, even though they are the most prolific at prescribing opioid painkillers. They handed out fewer than five Suboxone prescriptions per doctor in 2013, the findings showed. Family doctors also failed to use Suboxone, averaging about seven prescriptions per physician, the study said. Yet, family doctors averaged 161 painkiller prescriptions per physician. Doctors may be reluctant to prescribe Suboxone because they know little about its use, Lembke suggested. "Doctors receive very little education in medical school and residency on the treatment of addiction disorders, and understandably doctors don't like to implement treatments that they don't know how to use," she said. In addition, addiction continues to be seen more as a moral failing than an illness, and doctors may not be comfortable treating a confessed addict, Lembke said. "They're very, very worried any opioid they prescribe is going to be misused in some way, and this population is more likely to misuse it," she said. Dr. Harshal Kirane pointed out that doctors might not even know that their patient is an addict. He is the director of addiction services at Staten Island University Hospital in New York City. Kirane said only about one in every three drug addicts in the United States has been diagnosed with addiction and is receiving treatment. Further, federal regulations governing Suboxone use make things even tougher for doctors, Kirane noted. Physicians must receive special training and receive certification from SAMHSA before they can prescribe Suboxone, he explained. Doctors are then allowed to only treat 30 patients with the drug during their first year. After that, doctors must file an additional request that will allow them to treat up to 275 patients, Kirane added. "If you have a DEA [U.S. Drug Enforcement Administration] license and a medical license, you can prescribe as much oxycodone as you choose," he said. "To prescribe Suboxone, there are restrictions in place that require some time and monetary investment on the part of the physician to be certified." Finally, Lembke said, although this isn't the case for Medicare, most insurance companies don't willingly cover Suboxone. "I can tell you I have to fight with insurance companies often to have them approve a Suboxone prescription. But if I wrote a Vicodin prescription it could be filled within the hour at the local pharmacy," she said.